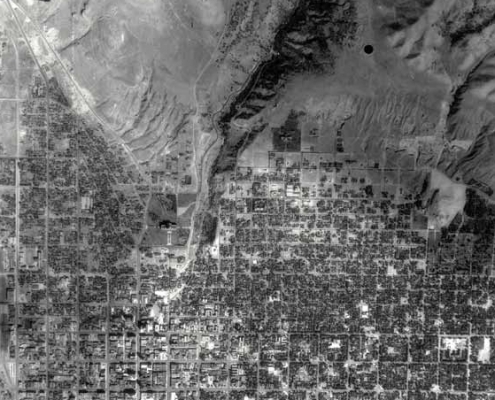 Annotated 1970 low-sun-angle aerial photograph of Lower Bells Canyon Reservoir and the Salt Lake City segment of the Wasatch fault, which crosses the photo from top (north) to bottom (south). This photograph was taken in the afternoon so west-facing scarps are illuminated and eastfacing scarps are shadowed. Low-sun-angle photographs from this aerial project were used to highlight fault scarps along the Wasatch Front and are used for fault-characterization and geologic-mapping purposes today. Recognizing the value and importance of physical and digital geology-related resources, the Utah Geological Survey (UGS) in partnership with the U.S. Geological Survey (USGS) started a Geologic Data Preservation Project in 2007, to collect, inventory, preserve, and manage geologic data of value for future use by industry, government, academia, and the public. These data are an important resource for those involved with land-use planning and management; geologic, geotechnical, and environmental investigations; mineral and resource exploration; real estate due-diligence activities; environmental protection; academic research; and teaching. Making these data easily available will significantly enhance these activities by providing more complete background data. In addition, end-users of data held by the UGS may realize cost savings from not having to acquire the data directly themselves. As part of this project, the UGS has inventoried, archived, and made available to the public a variety of geologic data, including aerial photography covering Utah and surrounding areas, engineering geology and geologic-hazard reports, and geologic maps. 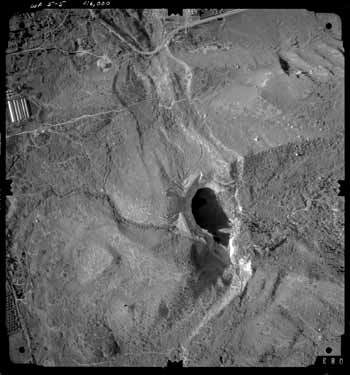 The UGS Aerial Imagery Collection contains aerial photography of Utah dating from 1935 to the present, with about half of the collection dating before 1960. The collection includes over 120,000 frames (individual photographs, of which over 75,000 have been scanned and entered into a database) and associated indexes, orthophotomaps (semi-controlled orthophotos), and other materials. Various federal government agencies originally acquired most of these frames for agricultural management purposes, and this photography is now integral to many geologic projects, such as geologic mapping and geologic-hazard investigations. 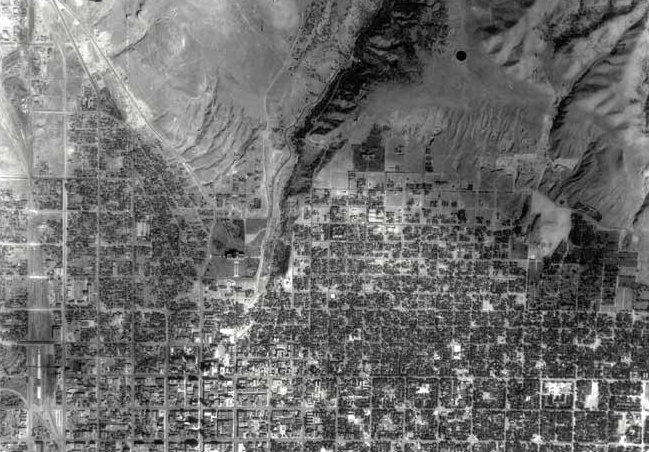 Prior to this project, the majority of the pre-1955 federally acquired Utah aerial photography was only available as a copy from the National Archives at a significant per-frame cost. Most of the frames acquired are in stereoscopic mode, such that successive frames overlap, creating stereo pairs that provide a three-dimensional image when viewed with a stereoscope. A small percentage of the frames are low-sun-angle photographs acquired during the morning or afternoon when shadows highlight certain topographic features. The UGS developed a database system to manage the collection and store associated information (metadata) that can be accessed through a web-based search and download application available at http://geology.utah.gov/databases/imagery/. The UGS has collected unpublished reports, maps, memorandums, field notes, consultant reports, and other geologichazard and engineering-geology documents since the formation of the Site Investigation Section (now Geologic Hazards Program) in 1980. Few copies were ever produced of most of the documents in the collection. The new UGS GeoData Archive System compiles Utah geology related scanned documents, photographs (except aerial), and other digital materials from our files and those gathered from other agencies or organizations into one easy-to-use web-based system. Resources available to general users are in the public domain and may contain reports submitted to state and local governments as part of permit reviews. Each resource is searchable by metadata describing each resource, along with spatial searching for resources that are local or site-specific in nature. Resources representing counties, regions, or other large areas are not spatially searchable at this time and require text-based metadata searches. Not all resources may be available to all users due to copyright and/or distribution restrictions. Upon searching for specific materials, users may view them directly or download them to their local device. Documents are predominately in text-searchable PDF format and photographs in JPEG format. The UGS GeoData Archive System is available online at http://geodata.geology.utah.gov. The UGS Geologic Map Database (MAPBIB) contains approxmately 2,850 geologic maps covering various parts of Utah, dating from about 1890 to present, that vary from published USGS and UGS Map and Bulletin Series maps, to informal consulting reports and internal unpublished “sketch” maps. Over 1000 maps in the database were either produced in only limited numbers, are completely out of print, are in remote libraries, or are limiteddistribution, informally published literature that is difficult to locate. For a few hundred of the maps, only a single copy may exist. Our long-term goal is to locate the best possible copy of all Utah geologic maps, and to produce and archive a high-resolution digital scan of each map in the MAPBIB database. Since 2009, the UGS has inventoried, cleaned, and scanned 918 geologic maps covering various parts of Utah. The UGS has spatially referenced each map with 16 points (if possible) to create JPEG and GeoTIFF images of each map, and created a footprint for each map for future spatial indexing and locating. Many of these maps are available online at http://geology.utah.gov/maps/geomap/interactive/index.htm. This and other geologic data preservation projects will allow data held by the UGS to become more readily available to the public through inventorying, creating metadata, and developing creative information delivery methods, such as enhanced Internet information products (UGS GeoData Archive System, web mapping applications, and others) and continued collaboration with the Utah Automated Geographic Reference Center and other organizations.